BRISTOW, VA – It’s often said that practice makes perfect. That’s highly debatable, and when it comes to playing the game of golf, it’s downright false. Broad Run's 75 practice stations provide plenty of room for your full-swing practice - there's always a spot if you need it. 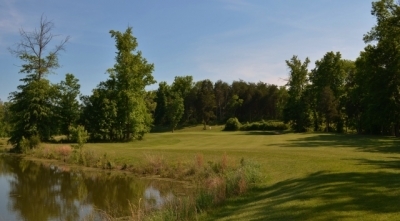 But if the pursuit of golf perfection is what you’re looking for, then one of the best places to try and find it is at the Broad Run Golf & Practice Facility in Bristow, Virginia. For those unfamiliar with the area (just west of Manassas), Broad Run used to be somewhat isolated out in the countryside – but with all the building going on in the vicinity, the facility is now centrally located to many who can easily take advantage of it. That’s good news for all you practice nuts – and should be good news for the rest of you perfection seekers as well. Broad Run opened in 1998 with a unique concept and a goal – to offer the best practice area in the DC region – and although I haven’t seen every practice facility in the Virginia and Maryland suburbs, it’s the best one I’ve seen that isn’t private. 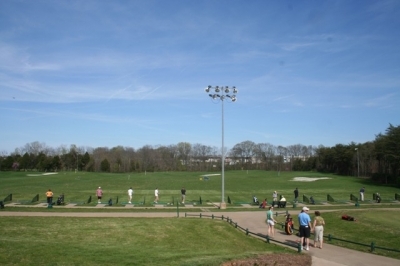 Broad Run offers a large driving range with natural grass tees and enough driving stations (with mats) to service a whole crowd of practicing golfers. There are also ample covered (and heated) stations to protect you from the elements – or even the fierce Virginia sunshine, if need be. 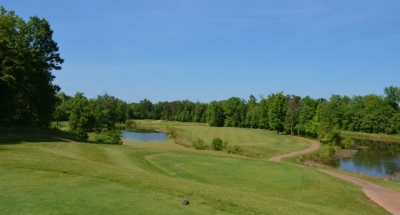 Broad Run's nine-hole course begins with a straight-forward short par four - but keep it in the fairway, or you'll be practicing your recovery shot. 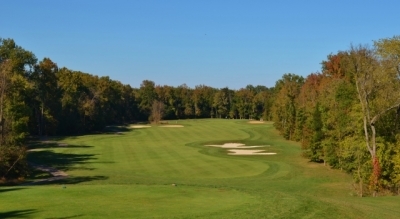 In addition, Broad Run has an excellent short-game practice area, complete with mowed fairway grass to practice pitching, thick rough to work on shots from the tall grass and bunkers to hone those ever-elusive sand shots. The practice green servicing the short-game area is large enough to hold three cup positions, so you can practice short shots of different lengths without moving around – yet another nice feature. And there’s nothing like saving a little time when you’re at the range. All of this practice paradise is visible to passers-by along Route 28, which perhaps obscures Broad Run’s best attribute, its Rick Jacobson designed regulation length nine-hole course (Jacobson designed the practice facilities as well). The nine-hole course can’t be seen from the road and remains, strangely enough, somewhat unknown in these parts. All the trouble's to the sides of the par five 2nd hole. “I’ve got some buddies who’ve come here and said ‘I thought you only had a par three course.’ Then I’ll take them out to the fifth tee box to show them the incredible view—and impressions are changed quite rapidly. But unfortunately, I can’t whisk everyone out there to show them what we have,” Hashagen adds. 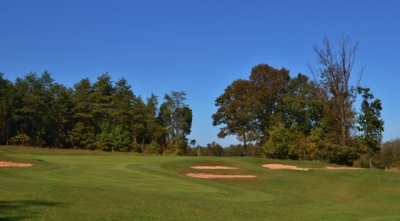 Perhaps people figure that Broad Run is all about practice – but the course itself is a great way to try out the swing concepts you’ve just been working on a few hundred yards away. Add the fact that there’s no housing development in sight from the golf holes and you’ve found another rare golf commodity in Virginia. The first of Broad Run's three par threes, the 131-yard 4th hole will test your short approach shot skills. Since it’s a given that we only have so much time for golf – either practicing or playing – it’s important to divide up your time to your best advantage. At the driving range you invariably see most people devoting the bulk of their minutes to their drivers, but Hashagen says that’s the wrong place to focus. “If you have two hours to practice, I’d divide up the time to emphasize your short-game – an hour in the short-game practice area, a half-hour on chipping and putting, and a half hour on your full swing,” Hashagen lectured. The view from the 5th tee proves why Broad Run is much more than just a good place to practice your golf game. It’s true – hitting your new driver is more fun than trying to get chips to stop close to the hole, but Hashagen makes a point: you’ll use your driver at most fourteen times a round (and probably not even that many), while if you’re a mid to high handicapper, you’re most likely chipping and putting at least four to five times more than that. The nice thing about Broad Run is it presents the opportunity to do all sorts of practice shots within a short walk of each other. And if you’d like some additional help (in the form of instruction), that’s available too. Broad Run’s instructional programs are led by Dave Predzin along with his assistant, Clay Farnsworth. As would be expected at a facility like Broad Run, Predzin offers a wide range of lesson plans for all types of players, from juniors to adults to couples to groups. There are also special programs such as summer golf camp for juniors – what better way to introduce your kids to the game of golf? The 226-yard, par three 6th hole is rated Broad Run's second most difficult. 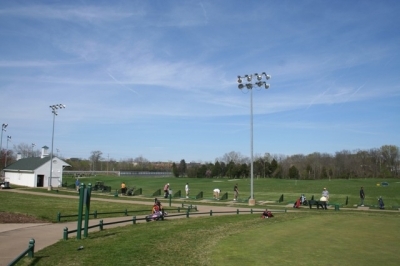 Yet another appealing amenity at Broad Run is its miniature golf course, which Hashagen says is very popular for birthday parties and kids of all ages who want a little putt-putt apart from the more ‘serious’ notions of practicing golf. 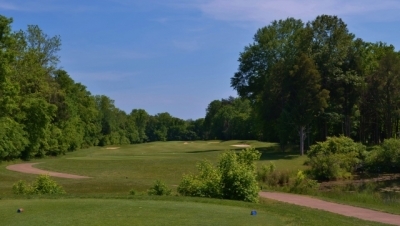 Taking it all into consideration, Broad Run is a multi-faceted golf facility in just about every way. 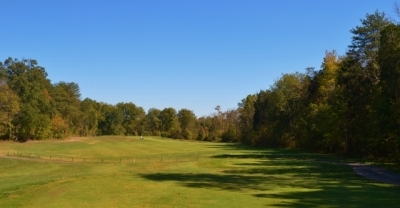 As mentioned above, Broad Run’s nine-hole course is a regulation length layout with three par threes and two par fives (par 35). The course stretches to just over 3000 yards from the back tees, and is difficult enough to maintain your interest. The 548-yard, par five 7th hole is Broad Run's longest hole - and as you can see, it's one of the most forgiving as well. Tight tree lines and water will also test your accuracy on several holes. If you’re hooking your driver on the range, better leave it in the bag on the course! One final note is Broad Run’s pricing -- you’ll have a hard time finding a better deal anywhere. Value is a fleeting concept -- like beauty, it’s often in the eyes of the beholder. But even looking at it objectively, the most you’ll pay to play 18 holes at Broad Run (the greens fee plus a replay rate) is $65.50 (including cart), even during primetime in peak season. The course’s bentgrass tees, fairways and greens are almost always in good condition, too. Looking from behind the green of the par four 9th hole, you can see how Broad Run's tree cover gives it a 'private' feeling. Taking a look at the layout, the course begins with a very tame ‘warm-up’ hole. 322 yards and straight on, take an iron off the tee to keep it in the playable area—as trees encroach on both sides of the fairway. Skipping to five, you’ll marvel at the view from the tee box -- downhill and you’ll need to carry a lake. The hole looks harder than it plays, because the landing area is quite wide if you clear the water. But your work’s not done after your tee ball -- you’ll still need to carry a stream to reach the green on your second shot. 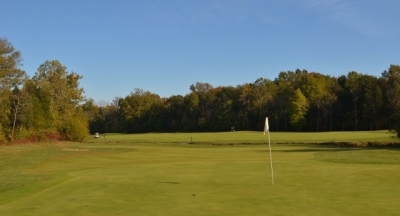 The Broad Run range provides target greens and bunkers to hone your iron shots. Seven is the polar opposite of the short but tight holes. 548 yards of par five, you’re again teeing down a considerable slope -- and this time, the clearing’s incredibly wide. You’d really have to hook or slice badly to get in trouble on this hole. Big-hitting hacker’s paradise! It’s also an inspiring view. Even if you can’t achieve perfection with practice, the experience you’ll get at Broad Run makes you actually want to keep trying. It sure as heck beats working on those violin lessons your parents made you take when you were in grade school. Note: Night lighting allows for practice after work! Weekday rate: $21.50 for nine holes. $33.50 for 18 holes. Weekends: $28.50 for nine holes, $47.50 for 18. Carts are $9 per person per nine holes. The golf course is very walkable, with greens close to the next hole’s tees, and only a couple slopes that require much exertion.